Spilfyter offers you the best in sorbent products with its G-76 universal black heavy weight drum top pad! Bringing you extreme wicking and overall performance, this universal absorbent pad is designed for drum tops to soak up pump drips and keep work areas neat and clean. Two precut holes provide a perfect fit on your drum tops. 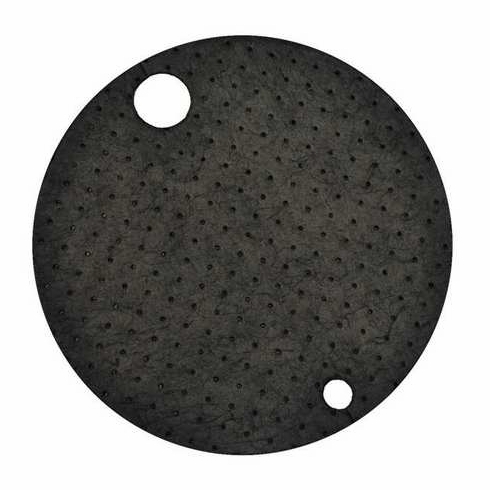 This pad absorbs a variety of spills including oils, coolants, solvents, and water. Be sure your establishment's janitorial supply closet has this pad in stock! Featuring a dimple bond pattern, the overall physical strength of the polypropylene is increased and it allows for quicker wicking of liquid and easier cleanup. The double weight construction also increases absorbency and strength. Each case is capable of absorbing a total of 11 gallons/42 liters of liquid. Easily absorb unsightly spills with this premium sorbent drum top. Plus, its dark black color helps hide stains so it always look clean! Made of 100% recycled material, this pad is not only functional, it's environmentally-friendly! This pad is also packaged in a 100% post-consumer recycled corrugate box while all printing is done with eco-friendly water-based printing inks. (G-76): 22" Diameter Double Weight Drum Top 10/case, Gray Universal MRO Double-Weight Drum Top; 25/cs (ABSORBS UP TO 7 GALLONS/26 LITERS PER CASE). • Absorbs and retains oil, water, solvents, coolants, etc. • Place on drum tops to soak up pump drips and keep work areas neat and clean. • Dimple bonded which speeds wicking of liquid for faster, easier cleanup. • Precut hole to provide a perfect fit. • Double weight construction is highly durable and absorbent.